DVD Includes openSUSE 10.3 "openSUSE Linux Unleashed" presents comprehensive coverage of the community version of SUSE Linux, one of the most popular and most complete Linux distributions in the world. This book provides detailed information on installing, using, and administering openSUSE. You'll learn how to unleash the vast array of software products included in openSUSE so that you can use it as a desktop computer, as a professional workstation, or as a powerful server. "openSUSE Linux Unleashed" includes a broad range of coverage: from using software you need everyday--such as email clients, web browsers, and productivity software including the OpenOffice.org productivity suite--to configuring and administering a wide range of network and server products, such as the Apache web server, and MySQL database. Additionally, this book provides details on openSUSE's acclaimed YaST administration tools, web programming, networking, and choosing from a wide selection of graphical interfaces and desktop environments, including both KDE and GNOME. Register your book at www.samspublishing.com/register for convenient access to updates and other resources related to this book. Michael McCallister has been making computing easier for the full spectrum of users for more than a decade. Currently a technical writing consultant with Compuware, he is also a senior member of the Society for Technical Communication and the National Writers Union. He has run a SUSE Linux installation since version 5.3 and knows firsthand how far the distribution has come over the years. Besides "SUSE Linux Unleashed," he is the author of "Computer Certification Handbook" (Arco Press), and has had articles published in "Linux Journal," SearchEnterpriseLinux.com, "Java Developer's Journal," "Internet Voyager," and "Isthmus." 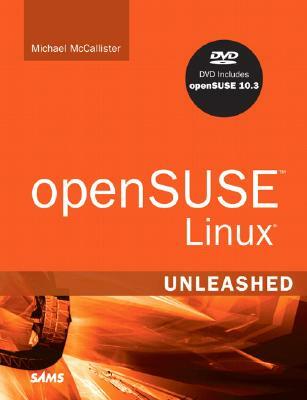 Category: Operating Systems/LinuxCovers: openSUSE Linux 10.3User Level: Intermediate-Advanced. Michael McCallister has spent all of this century and a part of the last making computing easier for the full spectrum of user levels and experience. He is currently a technical writing consultant with Compuware. Michael has run a SuSE Linux desktop at home since version 5.3 and knows firsthand how far the distribution has come over the years. Besides "SUSE Linux 10 Unleashed," he is the author of "Computer Certification Handbook, "published by Arco Press (2000), and his technology stories have been published in places such as "Linux Journal, SearchEnterpriseLinux.com, Java Developer's Journal, Internet Voyager, "and "Isthmus. "He is a senior member of the Society for Technical Communication and the National Writers Union. He blogs about working, writing and open source at "Notes from the Metaverse "(http: //metaverse.wordpress.com).